Great hostel, in the heart of Cartagena. Rooms with airco, nice pool, friendly staff and a nice bar. Best hostel i have been to, during my Colombia trip. Zeer goede vibe in dit hostel. Vriendelijk personeel en hele chille bedden. Perfect spot for a carefree stay in Cartagenas’ beautiful old town. We stayed at republica a bit at the end of our trip, and this is def one of our favorite hostels. Its a really social hostel with a nice vibe. Location is really nice, with bars restaurants shops and clubs nearby. Awesome beds like big capsules witch are provided big private space. Great hostel, not too big, in the Walled City of Cartagena. Good location, nice big bunkbeds, thick matresses, nice breakfast (although not big enough to be filling). Nice that they have a small pool and a roodtop terrace. Makes the place nice to lounge when you just wanna chill for a bit. Would def recommend this hostel to people. Hostel looks good, beds are really comfy. Downside: not that social. People are on their phones a lot and the hostel doesn't organize any activities in the common area. Everyone seemed in their own bubble. 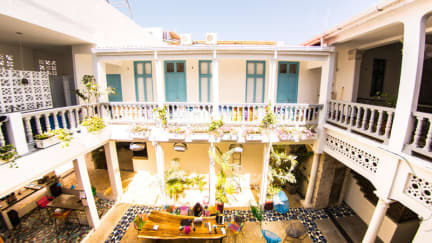 Surprised that it is considered the best hostel in Cartagena. Good location. However the hostel felt too crowded and the reception was always doing multiple things at a time so when we booked our bus to our next destination with them this went wrong. On arrival the staff was very unhelpful. Once I received my writsband and paid I was told ‘you can go now’ without any further information. Had to ask everything myself, such as where to find my room and the wifi password. The beds are good. Bathrooms should be cleaned way more often. Breakfast is really very basic, not much choice and not enough for a good start of the day. Location is great. All in all in my opinion value for money is not sufficient.